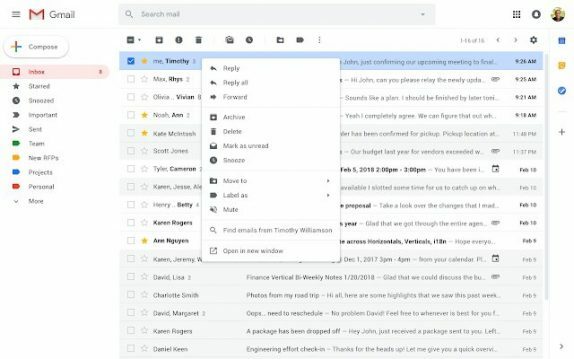 Gmail’s new Web UI rolled out almost a year ago and the platform ever since has been constantly gaining new features including snoozing for emails and much more. The company today is adding a new context menu for the right click with twelve commonly-used actions. The current situation allows users to right-click to move email between tabs, archive, mark as unread, and delete the email. With this new inclusion, it will be getting a lot more options including replying, forwarding, muting, search for all emails from a sender, search for all emails with the same subject, easily add a label or move an email, and open in a new window. The roll-out for this update begins starting from today, and G Suite users will be getting it first. As for the regular Gmail users, they should get the update in the weeks to come. To evoke the right-click context menu, users can also ctrl+click on the Mac keyboard and menu key on the Windows keyboard.